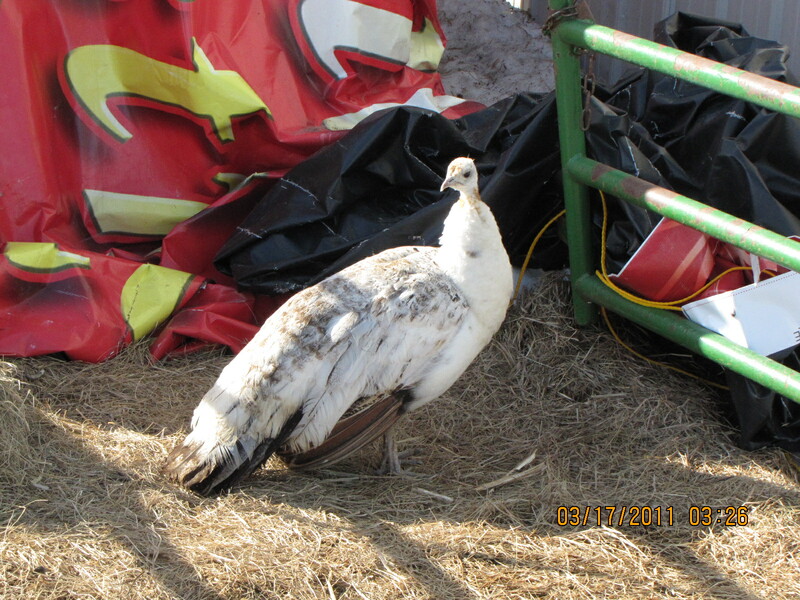 In our Just For Fun page, we have our Beefalo cattle, Whitetails, Miniature Donkey jennies, “Al” our Alpaca/LLama cross gelding, and our Peacocks. 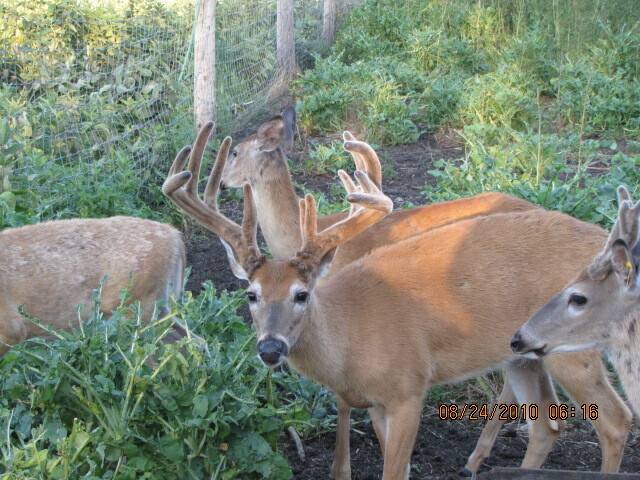 The Whitetails we had selectively bred to produce huge bucks that were quiet and not freaky. Our last breeding yearling buck scored in the 160’s – his picture is shown above. He was a very quiet buck that would eat out of your hand. The last (3) does that we have on the farm include (2) does from this large yearling and a dam of one of those does. The dam is a daughter of Lyman Seybold’s “Bard” buck which scored 250+” at 3 years old. These does are very tame and would make great breeding stock if we decided to ever have them bred again. 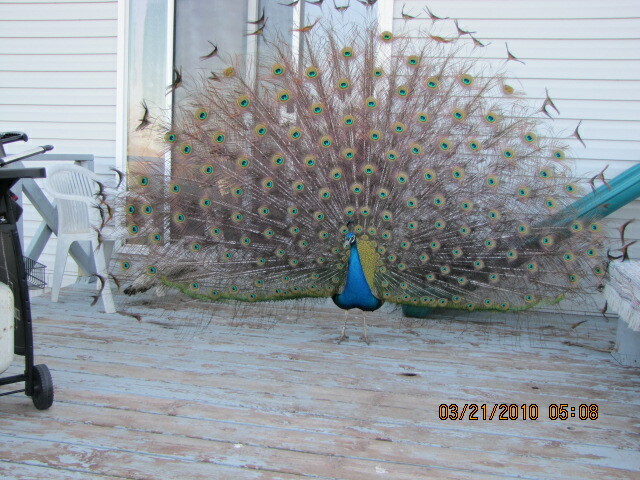 The peacocks that we have on the farm all have Indigo Blue breeding and some are pied and some are white speckled. We have some beautiful birds with the male having a 10′ tail fan when he’s showing. The picture above shows him standing on a 14′ wide deck and there isn’t much room on either side of his tail. We don’t keep our birds locked up and they pretty much full range around the farm. They love to come to the campfire at nite when we’re enjoying the evening and snack on chips and cheetos. When they walk or run, you can tell where the dinosaurs went. They have that same “carriage”. They’re beautiful birds. 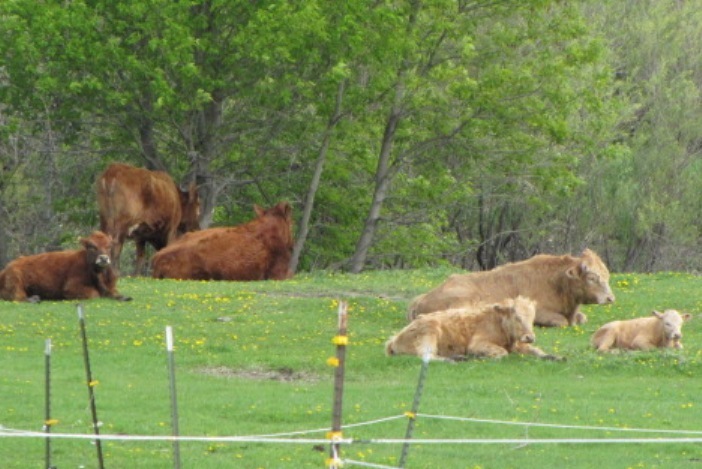 We also raise Beefalo cattle and have been raising them since 2005. We live in Central Minnesota and these hardy creatures do well in our ever-changing climates. They are quiet and easy to handle like any other domesticated type of cattle. Our original bull was 37.5% buffalo and our cows are 37.5 to 49% buffalo. The beef side consists of Charolais in the bull and Simmental and Hereford in the cows. The one noticeable characteristic of our cattle is the build or structure of the animal. Our Beefalo tend to be a little more front end heavy than the normal beef animal with a huge shoulder, neck, and chest cavity. They are extremely less fat and are very low in cholesterol. We have purchased a new bull now in 2012 that is 25% buffalo and 75% Red Angus. We are hoping to add a little more in the ribeye area and maybe a heavier hip by adding in the Red Angus without sacrificing the low fat and low cholesterol. We don’t believe that it will change the lean, just change the structure of the animal. A little background information on the Beefalo cattle: Beefalo Cattle derived from the mating of a domestic bull with buffalo cows. These hybrids have been intentionly bred since the 1800’s with limited success. In 1965, successful hybrid offspring that were docile, fertile, and hardy championed most others and have started the “Beefalo” geneticism. The new name, Beefalo, was meant to separate this hybrid from the problems associated with the old cattalo hybrids. The breed was eventually set at being genetically at least ⅝ Bos taurus and ⅜ Bison bison. A USDA study showed beefalo meat, like bison meat, to be lower in fat and cholesterol. The association claims beefalo are better able to tolerate cold and need less assistance calving than cattle, while having domestic cattle’s docile nature and fast growth rate; they are also thought to produce less damage to rangeland than cattle. We also have (2) miniature donkey jennies that we received in January 2012. They are small and cute little donkeys. The jennies stand 30″ and 33″ tall. They are ultimately spoiled beyond belief. They spend their winter nites in the barn in their own stalls next to the show horses. The girls are fed like the show horses and are quite vocal about any change in the meals if they think that they’re not getting something that they think they should be getting. They are quite protective on the farm and we keep them as guard animals in the pastures along with our Alpaca/LLama cross gelding “Al”. The donkeys and the Alpaca/LLama are excellent guard animals and do not allow anything in the pastures that do not belong there – from coyotes to otters to our kid’s hunting dogs. Everything is escorted off the property or removed physically. They are quite efficient and coyote tracks on the river around the pastures show they avoid the pastures with a passion.